I haven’t read many graphic novels for a while now but when I saw this one, with an obvious theatre connection, and set in the Roaring 1920’s (an era I enjoy reading about) I thought that this just might be the right book for me. Rudy Burns is living the high life. He’s a sought-after Broadway actor. He has women adoring him, but he’s happy with his wealthy, socialite girlfriend. And when he decides to stay out all night and party, no one is going to stop him as long as he keeps spreading the cash around. When he leaves a club well after closing hours one night, after having too many drinks, he is jumped by a group of thugs. Not in his right mind, thanks to the drinks, he thinks he can fight back and take them all one, which only brings more anger from the thugs, who take Rudy out with pipes and a crowbar, and they work him over. Even with a long rest period and as much cosmetic surgery as could be done in the 1920’s, Rudy’s good looks are now gone. In fact he now looks more like Frankenstein’s monster – a patchwork of skin and bones – than the red-hot golden boy. He’s always been the leading man, but no Broadway play will have him now. He can’t even get parts as the villain in smaller theatres – his looks frighten people. To add insult to his injuries, his girlfriend, returning from France, tells him that she ‘s going back to France where she’s met someone she wants to be with. He is about to give up and take his own life, when his best friend, Sam, has an idea that will still involve acting. Sam wants to make Rudy into a mysterious figure … a Count who is seeking vengeance for his family … and get him into some boxing matches. What I liked about this was the over-all concept, the fact that Rudy becomes a rather true character that we can actually get behind and root for, and the general art layouts and angles. What I didn’t like, though, stood out a little more. The story is just a little bit lopsided and rushed. We don’t really get to know Rudy except for superficially. There is a HUGE change in Rudy after he gets beaten up. Yes, we should expect some emotional change, and author Neil Gibson does a nice job of helping us understand the pain Rudy is going through. But there is a physical change beyond the startling, facial appearance. He appears to have grown about six inches and put on 100 pounds of muscle since getting the crap beaten out of him. And his now changeable demeanor – violent and brutish when acting the part of The Count, and brooding and kind when alone – is not at all what we first saw in the happy, carefree man. Also, 1920’s New York had its own style and feel and verve and Gibson never writes to this, except to toss in a few choice words (such as “clams” for money), and certainly artist Leonardo Gonzalez does not capture this period at all. If you had told me this was the 1950’s I could easily have believed it. The fact that we haven’t captured the period doesn’t change the story much, so why was it set in this period? I wanted to like this book, but it just unraveled on too many factors to be worth recommending. Looking for a good book? 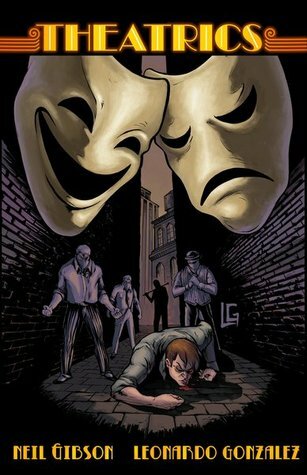 Theatrics is a graphic novel that doesn’t take advantage of the period in which it is set and rushes through the story and the art.